We're back! With the 2018-19 season just a week away, Sam and Jake reconvene (with Crespo on a beach in Mexico) to break down the Eagles with a dose of optimism after two forgettable seasons. What can AU do to bounce back? That and much, much more. Just listen! 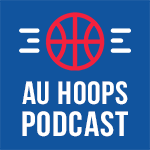 Jake chats with AU assistant Scott Greenman, and then Jake and Sam break down the biggest storylines after nine games and look ahead to Patriot League play. Crespo isn't quite back from his Icelandic adventure, but Sam and Jake are here to break down AU's 0-3 start including the freshmen's big minutes. They're also joined by Jaden Daly of Daly Dose of Hoops for insights on Wagner. 0-22: Insights from three games, biggest questions.